A full-color beginner guide to the basics of the Nikon D600 The Nikon D600 is a professional-level full-frame sensor that is sure to attract an audience of DSLR newcomers and pros. This friendly-and-thorough full-color guide shows you how to get a firm grasp on this powerful camera and helps you to ultimately get better photos. Helps you shoot in Auto mode and manage playback options, and walks you through basic troubleshooting Teaches you to take creative control by adjusting manual settings to get better results from exposure, lighting, focus, and color, then apply those settings to a photo session Offers invaluable advice on video mode along with the new autofocus features Details sending images to a computer for organizing, editing, and sharing Nikon D600 For Dummies takes aim at a fun-but-understandable way to help you better understand this amazing camera. 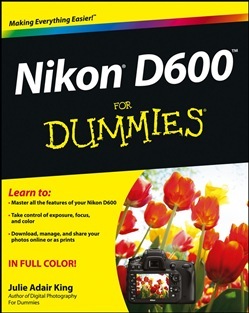 Acquista Nikon D600 For Dummies in Epub: dopo aver letto l’ebook Nikon D600 For Dummies di Julie Adair King ti invitiamo a lasciarci una Recensione qui sotto: sarà utile agli utenti che non abbiano ancora letto questo libro e che vogliano avere delle opinioni altrui. L’opinione su di un libro è molto soggettiva e per questo leggere eventuali recensioni negative non ci dovrà frenare dall’acquisto, anzi dovrà spingerci ad acquistare il libro in fretta per poter dire la nostra ed eventualmente smentire quanto commentato da altri, contribuendo ad arricchire più possibile i commenti e dare sempre più spunti di confronto al pubblico online.